Why Subscribe to Our Service? Don’t have a PayPal Account? Contact us here. Our Horse Racing Tips are the most consistent and reliable racing tips in Australia. We have been helping punters since 2005 and aim to provide you with a reliable service so you can work out your own punting strategy to help you generate a few extra dollars each week. Our service only costs $14.95 per Month, we have keep it that low because we have a lot of pensioners who use our service and love it. Join today and start working on a profitable betting strategy. 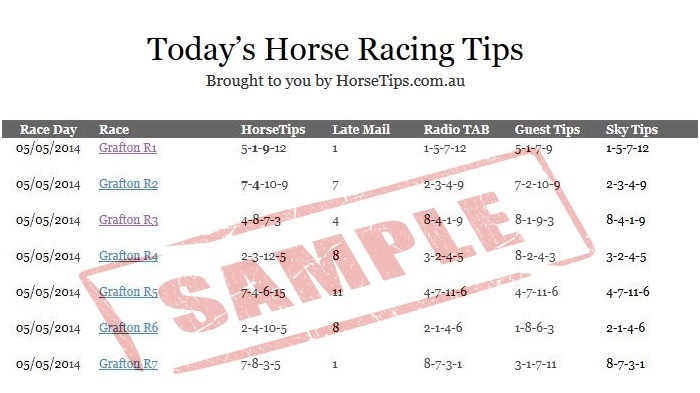 Thank you for your interest in our Horse Racing Tipping Service, HorseTips.com.au provides an Australian Horse Racing Tipping Service based on the latest Horse Racing Results and Horse Racing Forms. We currently have a large number of Professional Horse Racing Punters across Australia who use our services on a Daily Basis to help in their own Horse Racing Selections and Horse Form Analysis. Our goal is to provide an affordable Horse Racing Tipping Service to aid Professional and Beginner Punters across Australia. As statisticians we understand the percentages involved in Horse Racing and therefore we have priced our service at a very affordable rate to enable Punters to extract as much value and profit out of our Horse Racing Tips as possible. Thank you once again for your interest in our Horse Racing Tipping Service and hope we can help you achieve a consistent reliable income from your Daily Punting.